It's been a busy few weeks around here. Unfortunately it's been the kinda busy that's been keeping us from making serious progress around the house, though we are still trucking a long when we can to get things ready for this little ones arrival. I don't know if it's just me, but the list of things I feel like needs to get done seems to grow exponentially by the day. Not only do I want her nursery ready for her arrival, but I want to get all the little odds and ends wrapped up around the house, plus now it's yard work season, and it would be a major plus to get to enjoy some of this warm weather that's been heading our way! A while back I shared my inspiration for her nursery, and you can check out the before state of the room here. And this is what we're looking at today. I know it's a far cry from actually being finished. But the good news is, a lot of the big stuff has been done. 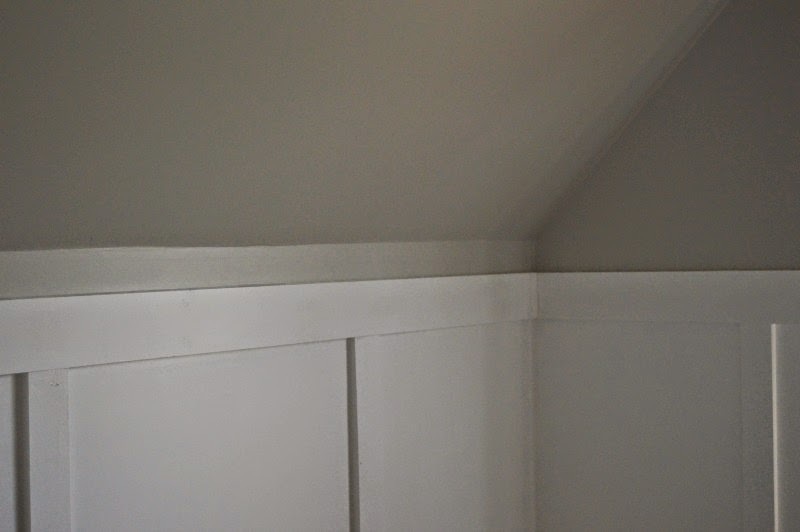 Martin has spent hours in here priming and caulking the board and batten and adding a fresh layer of paint to the entire room. 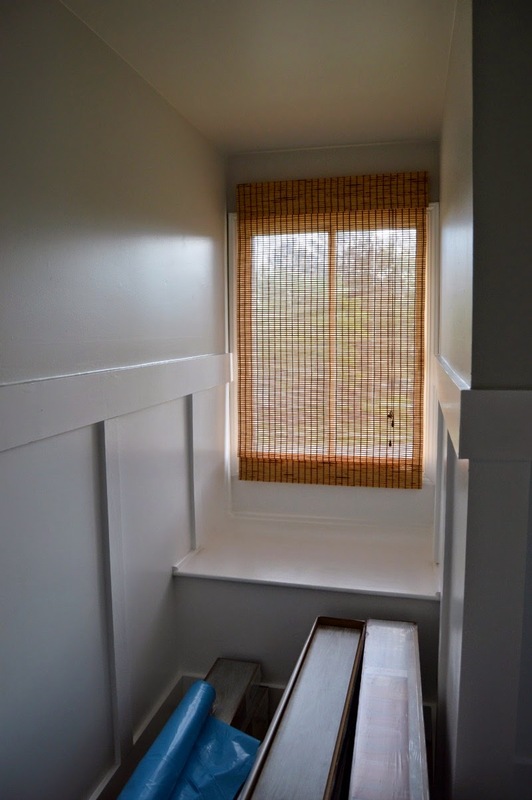 Here's the window seat area. Martin primed and painted the seat to match the rest of the lower area, and I plan to put an upholstered cushion and some pillows in there to make it more cozy. And hopefully a place that she can curl up with a book when she gets older. You can also get a glimpse at all of the flooring that has yet to be laid down! For the paint color I went with Behr's Silver Mist, the same color that we used in our bathroom remodel. I plan on keeping the base of this room pretty neutral, with adding pops of a blush pink color here and there. The light gray gives enough contrast with the white board and batten, but is still a very neutral look that you could really layer pretty much anything with. For the flooring we went with a floating laminate floor. Honestly we felt it would be the easiest to keep clean with 2 cats and a baby. Plus I've already picked up a big cushy area rug to layer on top. We used this same floor in my office downstairs and I love it. 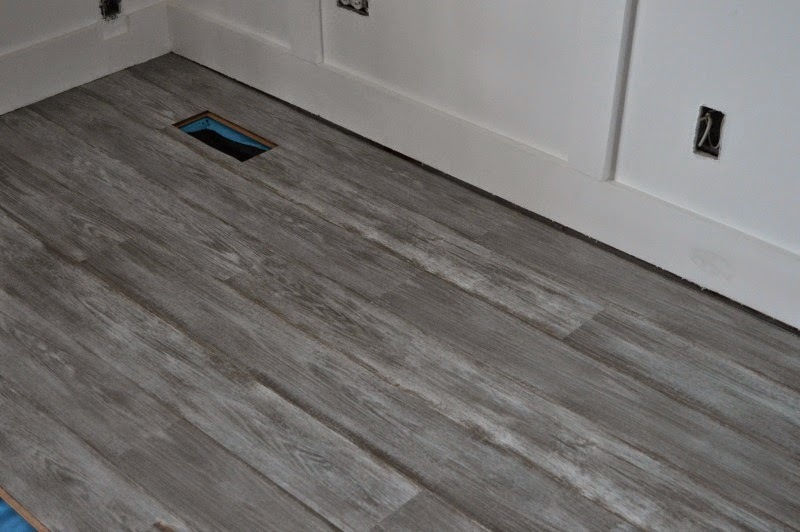 It's super easy to install, minus all the cuts for the angles of the room. We purchased the floor from Lumber Liquidators, it's called Dunes Bay Driftwood. We've only gotten about 1/4 of the floor laid, but Martin and I did that in just about an hour and a half yesterday. Once we get around the angled part of the room, the rest should go pretty quickly. 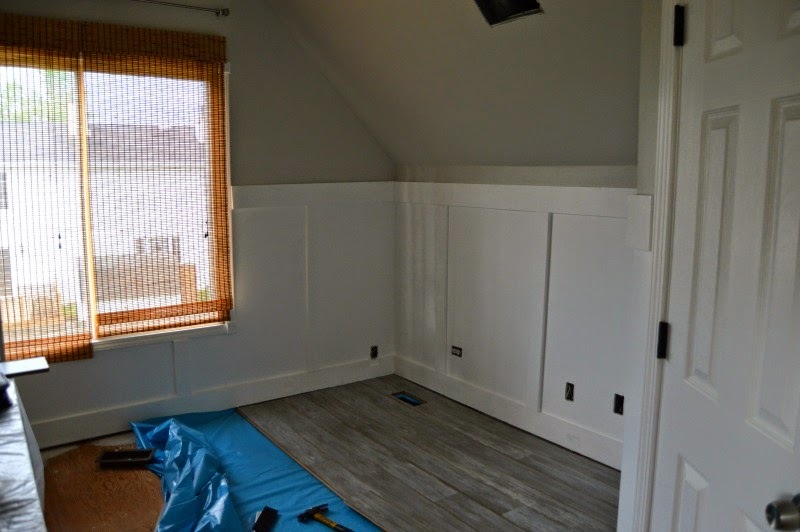 Once we finish getting the floor laid, we have some quarter round molding to install and paint to finish off the floor and then it will be time to assemble the crib and start to get the furniture into place. I can't wait for it to start looking like a usable room!